The Finance & the Purchasing Departments work together as one department. The functions performed within the Finance Department consist of maintaining accounts payable, preparation of the Municipal Budget, Annual Financial and Debt Statements, payment of bills, monitoring monthly budget controls and all other related accounting responsibilities. The Purchasing Office is responsible for the procurement of goods and services, in compliance with the Local Public Contracts Law. This centralized office receives bids and quotes when mandated, and oversees the process and award of all purchase orders and contracts. All state contracts and Middlesex County cooperative pricing contracts are maintained in this department. The Tax Collection Department is responsible for maintaining over 8,000 individual tax accounts and a like number of sewer usage accounts. Amounts charged and payments made are all individually maintained. The office hours are 8:00 am to 4:00 pm. Tax bills are mailed annually in July by the Borough. The taxes are due February 1, May 1, August 1, and November 1. A ten (10) grace period is provided by Borough resolution. Tax installments not paid by the due date are subject to 8% interest on the first $1,500.00 of the delinquency and 18% on any amount in excess of $1,500.00. Also, any delinquency exceeding ten thousand dollars ($10,000.00) pays a six percent (6 %) year -end penalty. These interest and penalties are the highest permitted under New Jersey statutes. Delinquent taxes open for one year or more are annually included in a tax sale in accordance with New Jersey statutes. The Tax Assessors Office is responsible for all assessment figures, addresses, mortgage holders, veteran deductions and senior deductions. Seniors — If you were 65 years or older as of December 31’` of the previous year, you may be eligible for a deduction of $250.00 annually, from your gross tax amount. Applicants must own and reside in the home on which the deduction is claimed. There is an income limitation of $10,000.00 combined income if married, excluding social security. Veterans — If you have served in the armed forces or if you are a widow of a veteran that never remarried, you may be eligible for a deduction of $250.00 annually, from your gross tax amount. There is 100% permanently disabled veteran deduction which grants full tax exemption for qualified veterans. Can I contact the Tax Collection office by email? How do I determine what my current tax payment status is? What are the hours of the Tax Collector’s Office? Tax bills are mailed once a year in July. Included in that bill are payment stubs for August, November, February & May. Failure to receive a tax bill does not relieve the owner from paying property taxes. The quarterly due dates are as follows: February 1, May 1, August 1, November l. There is a ten day grace period from each of the above dates which interest is charged. The interest rate is 8% interest on the first $1,500.00, and 18% for balances in excess of $1,500.00. This will be charged back to the original due date. Tax payments may be paid by mail or in person. When paying by mail please send a check with the appropriate payment stub. The canceled check will be the receipt. In person, please bring the entire bill and it will be receipted in the office. Automatic debit to your account and on line payment are also available for your convenience. My mortgage company pays my taxes, what are my responsibilities? You should only receive the advice copy of your tax bill if your lending institution pays your taxes. If you receive an original copy of the tax bill you should copy it for your records and mail the original to your lending institution. If I were to refinance or sell my home, what do I need to do? It is in the best interest to you, your mortgage holder and the new buyer that you have your current tax bill on hand at any closing. Should this be a refinance, the new mortgage company will need to know the next quarterly amount of tax due. For a sale the new owner will also need this information. I receive a senior deduction on my property, what can 1 do to maintain this deduction? On or before March 1, taxpayers receiving certain tax deductions must file an annual post tax year statement certifying income for the prior year. Real property is assessed in order to determine the basis on which property taxes are levied on each parcel of real property. All real property is taxable except property specifically exempted by law. Real property is assessed by the Borough’s Tax Assessor. Estimated market value is the Assessor’s determination of the value of your property for real estate tax purposes only. The assessed value is a percentage of estimated market value and will be the basis for your real estate tax bill. What is the “Notice of Assessment”? This is an official notice of your property’s assessment value for the current year which is mailed by the Borough’s Assessor prior to February 1st. What should I do about this notice? Absolutely nothing unless you disagree with the Borough’s determination of your assessment. First, you should contact the Tax Assessor’s office (732) 541 -3820 Ext 3110 to discuss the assessment. 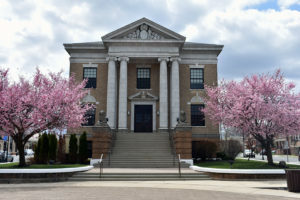 If you would still like to file an appeal after that, you may contact the Middlesex County Tax Board (732) 745 -3350 in New Brunswick for an Appeal Information Package.